Fire Dance, although not strictly a sequel to Last Song Before Night, returns us to that same world, set not longer thereafter. The consequences of Lin’s unleashing of long suppressed magic in the land of Eivar is only starting to be felt, with none understanding what this will truly mean. Raised to the rank of Court Poet, she now has the ability to guide matters...if only she were now under a vastly shortened life thanks to the events of that previous novel. When a request from the neighboring land of Kahishi, from a mage whose knowledge helped Lin and her companions defeat the threat in the previous novel, Lin feels compelled to go and help with what appears to be a magically backed insurgency. Things, however, are far more complicated than anyone suspects. The strengths of Fire Dance are the strengths that I found in Last Song Before Night. The author creates a world and describes and evokes in a way that transports me as a reader right into her creation and does not let me go. The poetry of her language really shines through in her worldbuilding and how she brings me as a reader into her secondary world fantasy. The Stephen Martiniere cover, for instance, depicts The Tower of Glass, a key setting in the book. Myer depicts this, as she depicts everything from the isolated isle of the Academy to the gardens of the royal palace, with a vividness and full sensory experience that many writers with far more novels under their belt deign to aspire to. Like the previous novel, I was drawn head first into the world that the author created. Lin is a strongly drawn character and I can her evolution from that would be student at the beginning of the previous novel is a strong and bright line of development. The consequences, the running out of time that Lin feels in this novel is palpable and ever-present, driving her actions in a believable way. Too, Julien, our other point of view main character, provides us a point of view back in the Academy, and her journey, although it is similar in some ways to Lin’s in the previous volume, follows an allied but distinctive path. Her voice in the fugue that is this novel echoes the previous work, but it does not ape it or copy it. The rest of the characters, however, do not work quite as well. The vivid writing and focus around the author’s characters means that characters without the spotlight are not quite as well illuminated as her two star heroines. Too, while the plot is crunchy and complex and unfolds well, I found myself a little less interested in the unfolding of it, and much more interested in the way that the author describes the world as it progresses. The experience of the world tha the characters inhabit overwhelmed the actual events and plotting somewhat. Like its predecessor, Fire Dance is a novel of place and language, a novel not to turn pages furiously to find what happens next, but rather a novel to turn pages to continue to go ever deeper into a vivid world that has wonders around every corner to show the reader. I strongly look forward to more of Myer’s writing, be it here, or in any world of her creation. 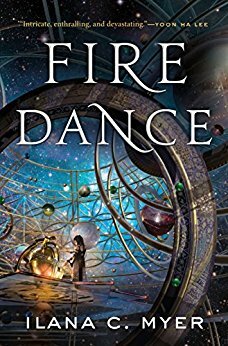 While I think Fire Dance is best enjoyed following a read of Last Song Before Night, I think given the change in venue and focus of the story in this volume, Fire Dance stands nicely alone as a way for readers to introduce themselves to the author's immersive work. I strongly look forward to additional novels set in this world. Bonuses : +1 for rich, intense worldbuilding. +1 for an absolutely fabulous command of language. The writing is poetic, gorgeous and immersive. +1 for strong pair of central characters with interesting characterization. Penalties : -1 the plotting and characterization of the cast beyond than the central characters, although improved from the previous volume, are not the strengths of the novel. Nerd Coefficient : 9/10 "very high quality/ standout in its category"